Let me start off by saying that I am not a huge fan of pumpkin anything (I'm more of a sweet potato fan, I could eat sweet potato anything throughout the year). I'm one of those people who have to be in the "mood" for it. (which usually comes around from September-November like most people). I had a can of pumpkin puree and decided to give a quick search on Pinterest for a recipe. I came across this super yummy recipe. I over cooked the muffins on purpose (I do not like mushy muffins). I also added a little more confectioner sugar to the frosting due to not liking the consistency. Overall, these babies were a huge hit in my home. I thought that they would be perfect to have on the go with coffee or tea. Especially on football Sunday. 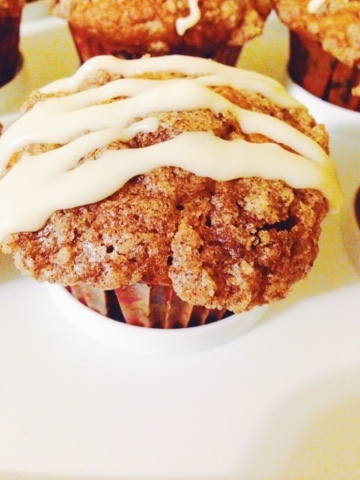 To make the streusel topping: combine flour, sugar and cinnamon in a small bowl. Add cold butter and toss to coat, using your fingers to work the butter into the dry ingredients until it resembles coarse crumbs. In a large bowl, combine the dry ingredients, flour, sugar, cinnamon, ginger, salt, nutmeg, baking powder, and baking soda. In another bowl, whisk together the wet ingredients, pumpkin puree, butter, eggs and vanilla. Pour mixture over dry ingredients and stir using a spatula just until moist. Scoop the batter evenly into the muffin tray. Sprinkle with reserved topping, gently press the crumbs into the batter. Bake for 16-18 minutes, or until a tester inserted in the center comes out clean. To make the glaze, combine confectioners sugar, milk, and butter. Whisk until smooth. If the glaze is too thin, add more confectioners’ sugar as needed. Once done, cool for 10 minutes and drizzle the glaze on each muffin.